When Were Toilets First Introduced to us? The toilet is one thing that everyone uses on a daily basis. But, how often do you find yourself thinking about the toilet? If you aren’t a plumber, most likely you have never thought about how does toilet work in reality. Most of the time we take toilet for granted. But can you think how our life would be without it? Sometimes, such thinking makes people wonder how actually things work. And if you are wondering how does toilet work, you are in the right place. You will find everything from the parts to the actual usage of them. Toilets were introduced to us a long time ago, even before you might have thought. This happened around 2800 years BC in an ancient city called Mohenjo-Daro. It’s the city which is most known for having the most modern and advanced toilets. They were usually built into the outer walls of homes. These toilets were mostly pots where people would have squatted. They are located on the ground or in the pits along the walls. Interesting thing is that in Pakistan and India, people used to build toilets. Along the water sources, where water would help them dispose of the human waste. Almost any civilization out there from 2000 to 4000 years BC had some kind of human waste disposal. Although, most of them were different, but not a lot. They still had the same purpose. Every civilization aimed forward toilets where the human waste would be easier to dispose. Most civilization used water as help. In our modern age, we still use water to help us dispose of human waste. The concept of toilets hasn’t changed, and the principle is the same. We only have the ability to do things in many different ways, than ever before. It’s not weird that you are wondering how things work. Especially things that we depend on and that we use daily. Toilets are pretty simple to understand. To understand how they work, you need to learn and understand the main parts of the toilet. Everyone understands what are the toilets for, right? So, you’re halfway there. Don’t worry, because it’s simple to understand the basics of the toilet. Maybe you have already been curious before. 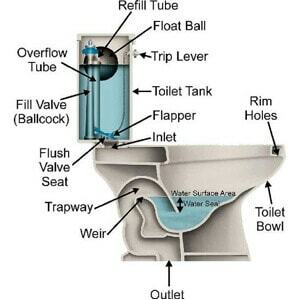 If you take off the top of the toilet tank, you have probably seen the mechanism and the way water flows. The parts and mechanism can look different and vary from the toilet to toilet. Regardless, the functions are always going to be the same. Bowl of the toilet consists of the rim where a person sits. Of the bowl which is visible, and the bowl siphon which isn’t visible. Although invisible, bowl siphon has the crucial role in the way toilet functions. The main role of bowl siphon is to take away the excess water. So the water in the bowl never rises up to the level other than recommended. The mechanism of the toilet is a second most important part. Its role is to successfully control the water flow of the tank and water in the tank. It’s important for the mechanism not to let the water too fast, yet not too slow in the bowl. Another role would be to hold the accumulated water once it was previously flushed. Without any possibility of having more water than tank capacity can handle. Refill system of toilet makes sure to refill the water into the tank. Once the water is flushed into the bowl, refill system closes the drain hole so the tank is refilled. Its job is to refill enough water so you can flush it again later. Now when you understand three main components of the toilet, it’s easy to understand how it works. You can’t make toilet work without any part missing. Everything starts with the bowl which is a place where humans dispose waste. Bowl siphon is connected to a bowl and its job is to take all the human waste away from the bowl. To empty the bowl and get it ready for another use, there’s where water comes to help. Water tank’s role is to hold enough water that will fill the bowl quickly when flushed. Mechanism inside of the water tank is there to release the water not too fast, yet not too slow into the bowl. After you have flushed your toilet, your human waste is removed from the bowl. But it’s time for the water tank to get filled with water again, for another use. That’s where mechanism comes in hand again. It covers the release drain so the water can be filled into the tank again. These three main parts perform one function with a simple press of a button. Most of the people don’t think about the toilet. It’s one of the things that we use on a daily basis. We can say for sure that we depend on it. With a simple push of a button, the whole process involving three different parts. I hope you understand the way toilet works now, and I hope you don’t take it for granted.